Page 2 SPACEPORT NEWS March 14, 1997New land-clearing equipment in use on refuge is a friend to natureA new piece of heavy machinery on the Merritt Island National Wildlife Refuge is a friend to the environment and wildlife, especially the endangered Scrub Jay. The Kendall Cutter is the only one in Brevard County, said Lead Forest Technician Gary Hoover of the U.S. Fish and Wildlife Service. It is specially designed to clear vegetation without disturbing the underlying soil. Kendall Cutters are often employed in densely overgrown areas to clear the way for power lines. On the refuge, the powerful piece of machinery is clearing parcels that are so packed with vegetation the material won't even burn, Hoover said. The cutter clears the stuff out, the old vegetation is then burned, and nutrients can then breath new life into the soil. In addition, the Cutter is being used to maintain habitat for the Scrub Jay, which prefers an edgeline area in the five-to-10foot range. The Kendall Cutter already is being put to work in the Happy Creek area and then will be taken south to work around the Tel-4 site.DESPITE its seemingly destructive effect on the landscape, the Kendall Cutter is actually a friend to the environment. The specially designed land-clearing machine removes vegetation that is so dense the soil can't be replenished and renourished. The Cutter also is helping to maintain the desired habitat heights for the endangered Florida Scrub Jay, which prefers growth in the five-to-10-foot range. ELV missions shaping upMarch is Women's History MonthIt may be called Women's History Month but the celebration is open to all. In honor of the accomplishments of women throughout history, a coffee is being held March 25 in the Space Station Processing Facility cafeteria from 2:30 to 3:30 p.m., sponsored by the Federal Women's Program Working Group. The keynote speaker will be Sharon Wagner, who oversees the Federal Women's Program for NASA in Washington. Her topic will be, A Long and Fine Tradition of Community Leadership All employees are invited to attend. Refreshments will be served. Saying thanksSTS-81 Mission Specialist Marsha Ivins (right to left),Commander Mike Baker, and Mission Specialists Jeff Wisoff and John Grunsfeld sign autographs in the Training Auditorium during a return visit to KSC March 4.Exploration Conference issues call for papersThe fourth in a series of international conferences focusing on lunar and Mars exploration has issued a call for papers. Abstracts of 250 to 300 words are due by March 31. The conference will be held Oct. 5-8 in Cocoa Beach, and is sponsored by Space Frontier Operations Inc. All aspects of the technology required for long-term lunar and Mars exploration will be addressed. For more information, contact Rita Howard, Email ritaofsfo@aol.com, or Conference General Chair Jan Hall at 407 453-3875 in Cape Canaveral. GOES-K CassiniFIRST stage of the Atlas I expendable launch vehicle that will hurtle the GOES-K spacecraft into orbit arrives at the Skid Strip on Cape Canaveral. This will be the last Atlas I in a series that has supported NASA missions since 1962. The Propulsion Module for the Cassini spacecraft arrives at KSC's Spacecraft Assembly and Encapsulation Facility-2 (SAEF-2).The extended journey of nearly seven years to Saturn and a four-year mission means Cassini must carry along a large amount of propellant for inflight trajectory-correction maneuvers and attitude control, particularly during science observations.The Propulsion Module features redundant 445-Newton main engines that burn nitrogen tetraoxide and monomethyl-hydrazine for main propulsion and 16 smaller 1-Newton engines that burn hydrazine for attitude control and trajectory correction. SPACEPORT NEWS Page 3 March 14, 1997 KSC Fire Chief Tim Moore oversees a work force of about 125 fire service personnel.KSC fire chief earns top FEMA certificationKSC Fire Services Chief Tim Moore has completed the Executive Fire Officer Program sponsored by the National Fire Academy (NFA) under the Federal Emergency Management Agency (FEMA). The certificate of graduation is the highest ranking a fire service professional can earn. The intensive four-year program is Employees of the MonthHONORED in March From left are Sandra Gregory, Safety and Mission Assurance; Kyle Longstreeth, Logistics Operations; Calleen Coiner, Biomedical Operations; Linda Ranow, Procurement Office; Dave Wilson, Administration Office; Janet Letchworth, Payload Carriers Program Office; Jeff Beyer, Payload Processing; and Jean Lewandowski, Space Station Hardware Integration Office. Not shown are Patrick O'Rourke, Engineering Development; Barbara Henderson, Chief Financial Officer's Office; and Robert Koenn, Shuttle Processing.NASA scholarship forms due March 31Application deadline for the NASA Scholarship Fund is March 31. In its 15th year, the program is offering five $2,000scholarships for the 1997-98 school year. The fund was established as a result of an unsolicited gift offer by Pulitzer Prizewinning author, James A. Michener. To qualify for the scholarship, applicants must be pursuing undergraduate science or engineering degrees at an accredited U.S. college or university in the and be a dependent of a NASA employee or retiree. NASA employees, including NASA co-ops, are not eligible. Applicants will be notified by mail of the results during May 1997. The program is managed by the NASA/KSC Exchange Council and applications may be obtained from Diane Holden in Room 2570D, Logistics Building on Contractors Road, or phone 861-1493 for more information. designed to provide senior fire officers with a broad perspective on various facets of fire administration. Moore is an employee of EG&G Florida, the KSC Base Operations Contractor which provides firefighting service in operational areas of the space center as well as managing the astronaut rescue program. NASA honors KSC workers with special events in Florida and TexasForty-six KSC NASA and contractor employees participated in several special events last month honoring their contributions to the U.S. space program. The Honoree Award is the highest form of recognition conferred by the Space Flight Awareness (SFA) program. Recipients are selected for their professional dedication and achievements in support of the human space flight program. Ten civil service employees from KSC received the honor: Jeffrey Angermeier, Guy Etheridge, Larry Jones, James Lichtenthal, Michael Murray, Robert Prohaska, Terence Ross, Dawn Steele, Norbert Violette and Doretha Worthy. Contractor employees honored were Robert Singleton, The Bionetics Corp.; Matthew McClelland, Boeing North American Inc., Rocketdyne; Kimberlee Cochran and Gary Grant, Boeing North American Inc., Space Systems Div. ; Henry Badore and Richard Blondin, Sherikon Space Systems Inc.; and Curtis Satterthwaite, I-NET Inc. Also Dennis Crocker, Christopher Pollio, Dorothy Rhine, John Schmalenberger and Willis Swarthwood, EG&G Florida Inc.; Lisa Roth, Wiltech Corp.; Martha Lynn Saltsman, Jack Selman and Joseph Smitelli, United Technologies, USBI; and Clifton Burkett, Wayne Derbyshire, Thomas Luman, A. Lynn Pemberton and G. Scott Strickland, McDonnell Douglas Space and Defense SystemsKSC. United Space Alliance honorees were Howard Baker, Donna Blankmann-Alexander, Robert Chancey, Leon Dufresne, Rodger Loeffler, James Marshall, David McCormick, Walter McCormick, Glen Miracle, Harry Moore, Douglas Oldham, Donald Runaas, Susan Schoettl, Lee Withington and Dallas Wright. On Feb. 9-11, KSC hosted the first STS-82 honoree event for about 250 NASA and contractor employees from KSC and around the country. Besides a special reception and VIP tour of KSC, the honorees saw the STS-82 launch from the Banana Creek viewing site. Later in February, the honorees and their families traveled to Houston for a two-day tour of Johnson Space Center that included attending the STS-82 crew return ceremony at Ellington Field.STS-82 SFA HONOREES from NASA KSC are, from left, Larry Jones, Shuttle Processing; Jim Lichtenthal, Safety and Mission Assurance; Guy Etheridge, Payload Processing; Dawn Steele, Biomedical Operations; Mike Murray, Logistics Operations; Doretha Worthy, Administration Office; Terry Ross, Engineering Development; and Jeff Angermeier, Shuttle Processing. Not pictured, Norbert Violette and Robert Prohaska. 14, 1997 SPACEPORT NEWS Page 5 M ENT OR Steve Lewis lunches with t s in the Operations and Checkout Building n Briefing Room during NASA Engineering tivities. Also acting as mentors for the day ate Wright, Tyrell Hawkins, Keith Manning, e na Humphrey ACTING Deputy KSC Director Jim Jennings spoke to the students attending NASA Engineering Day about the importance of education and the excitement of a career in the science and engineering field. KSC LAUNCH Director Jim Harrington (left) and Deputy Director of Space Station Hardware Integration Mike O'Neal (right) volunteered as judges for the poster contest on NASA Engineering Day Feb. 24. The first and third place winners were from John F. Kennedy Middle School and second place went to a student from Andrew Jackson Middle School. ABOVE The Engineering Development (DE) Directorate has an ongoing outreach effort to Oak Park Elementary School, Holland Elementary School and Rockledge High School as its designated schools, along with various other schools through classroom participation and science fair judging. This photo was taken during a visit of a KSC robot at Holland Elementary in Satellite Beach. Demonstrations with the robot have been taking place at other schools in Florida as well. Many other KSC NASA directorates participated in National Engineers Week events as well as playing a role in educational outreach year-round. Active contractors include McDonnell Douglas Space and Defense Systems, Boeing North American, and United Space Alliance which has recently created an education outreach lending-library to support engineers visiting local schools. DELIA Boughner of the Safety and Mission Assurance Directorate demonstrates the emergency breathing apparatus to a student at South Lake Elementary in Titusville. 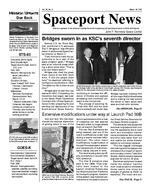 Page 6 SPACEPORT NEWS March 14, 199745th Space Wing gets new leaderBrig. Gen. Robert Hinson, 45th Space Wing Commander at Patrick Air Force Base is being reassigned this spring. Replacing him is Col. F. Randall Starbuck (Brigadier General selectee), who is presently the 14th Air Force Director of Operations at Vandenberg Air Force Base, Calif. The Eastern Range provides numerous services to NASA, including range safety, tracking and weather forecasting for Shuttle missions.Ames helping to develop faster Internet linesHigh-speed data transfer lines a million times faster than those of today are more than just a gleam in the eye of a team at Ames Research Center. Ames is the lead NASA center in a federal effort called Next Generation Internet (NGI), a three-year, $300-million effort to develop data transfer lines that are one million times faster than today's modern home computer modems and one thousand times faster than the current standard T1 business computer line. We want to guarantee levels of service that will eliminate slowdowns and network stagnation that users sometimes have to endure now while waiting for Internet images, movies and other services, said Christine Falsetti, NGI project manager at Ames. Our work should eventually allow users to do things they can't do today via the Internet, Falsetti said. Examples could include being able to see high-quality video programs on demand and conducting high-quality video teleconferencing via the Internet. The effort focuses on connecting regional groups of core organizations. Their separate computer network systems are connected to each other via high-speed lines. Ames and several universities in the greater San Francisco Bay area form such a regional group. NASA itself has five research sites connected to each other at 155 megabits per second. The goal is to increase the speed to 622 megabits. By comparison, a top-of-theline household modem transfers data at about 34 kilobits per second. Over time, the interconnectsX-33 work under way at multiple sites X-33 testing is under way at two NASA centers while the first welds have been completed on the oxidizer tank at Lockheed Martin Manned Spaceflight System's New Orleans facility. A quarter-scale composite liquid hydrogen fuel tank was successfully tested recently at Stennis Space Center. The 3,500-gallon graphite/epoxy tank, manufactured by Lockheed Martin Manned Space Systems, was filled with liquid hydrogen and pressurized to the X-33 operating pressure of 36 pounds per square inch gauge (psig). The tank contained the supercold fuel with strain levels showing good agreement with predicted values. Also being tested was the proposed cryogenic X-33 insulation, and this also performed well. Testing will continue through the summer. The first welds on the aluminum liquid oxygen tank were recently completed at Lockheed Martin Manned Space Systems in New Orleans. The same unit that produces the external tank for the Space Shuttle also will build two liquid oxygen tanks for two X-33 vehicles, said Nolan Harris, manufacturing supervisor for the project. Because the program has a tight schedule, the first vehicle is for flight testing and the second will be used as a structural test article. The completed tank is due on dock at the Lockheed Skunk Works in California Oct. 31, said Jim Kidwell, deputy lead of the metal liquid oxygen team. A subscale composite model of the X-33 was recently tested in Langley Research Center's Mach 20 helium wind tunnel. Testing is carried out at up to 20 times the speed of sound to collect data about the vehicle's performance at hypersonic speeds. AMES is the NASA Center for Excellence in Information Technology. It leads the agency in supercomputer research, and its supercomputers are the most advanced in the aerospace field. This Cray Y-MP C-90 supercomputer can perform more than six billion calculations per second. throughout the effort will transmit data at higher and higer rates of speed. Initially, NGI will be a national network, but we are looking for international partners to meet our global needs, Falsetti said. We are building a research network, she continued. Technical advances will spin off from NGI into the old Internet to make it work better and faster. A workshop is planned for May in Washington, D.C., to get feedback from industry and academia and to involve them in the project. Other participating federal agencies include the National Science Foundation, the Defense Advanced Research Projects Agency, the Department of Energy, the National Institutes of Health and the National Institute of Standards and Technology.LIKE the Shuttle, the X-33 will launch vertically and land horizontally. Page 7 SPACEPORT NEWS March 14, 1997 tions and associated piping and tubing, control cabinets and electrical cable are being installed, and a high-pressure compressed air system is being added. The system will be kept operational during construction work. USA, the Space Flight Operations Contractor (SFOC), is overseeing the varied activities because some of the work occurs in such close proximity. For example, the cabling that is being removed is located only about five feet from the elevator shaft. It has worked out quite well to keep the different activities under one management house, said Michael Palmer, USA supervisor of modification management. The cable work is set for completion this summer. The elevator upgrade is due to be completed by the time Columbia rolls out to the pad in September for Mission STS-87.Pad B. .(Continued from Page 1)trol room are at the top of the elevator shaft. Unlike the original elevators, the new ones will be enclosed in solid walls, an anti-corrosion feature. Where possible, old obsolete equipment is being taken out to ease maintenance requirements and reduce costs. Demolition is under way now to remove the old structure and then the new system will go in from the bottom up. The original motor remains, but the controller will be replaced with a more compact system. MidAmerican Elevator, Chicago, is the elevator contractor. General contractor is RKT Constructors, Titusville. RS&H, Merritt Island, did the specification work. The instrumentation cable work now under way at Pad B has already been completed at A, said Phil Suffern, Safety & Obsolescence (S&O) Cable Project manager. S&O refers to an ongoing effort to keep the launch pads operational through the end of the Shuttle program. The comprehensive cable system ties instrumentation in the field to the Launch Processing System. Twenty-three Ground Support Equipment and two facility systems are tied in to the cable network, allowing control and monitoring of individual systems and hardware. This includes such pad systems as liquid hydrogen and liquid oxygen. Pad water for the Firex and sound suppression systems and facilities pneumatics also is tracked through the cable network. Also getting a facelift is the Firex system. HM2 Corp., Titusville, has begun a two-year effort to upgrade and modernize the Apollo-era system. Outside the pads, the pumping station that services both pads is being modernized, and new pipelines are being installed to each pad. New pump assemblies with a 5,000-gallon-per-minute pumping capacity are being installed. Inside the pads, 18 valve staA NEW trench is visible inside the pad perimeter inside and parallel to the perimeter road at 39B, tracing the path of the new Firex system now being installed. The 30-year-old system will be kept operational at all times during the extensive overhaul and upgrade. REMOVING the old cable is tough, dirty work. Here, Bill Zale of Woodson Electric is cutting up the old cable to make it easier to remove from the pad.Historic Launches from Pad 39B Apollo 10: May 18, 1969 Skylab 2, 3 and 4: May 25, 1973, July 28, 1973, & Nov. 16, 1973 Apollo Soyuz Test Project: July 15, 1975 STS 51-L: Jan. 28, 1986 STS-26R: Sept. 29, 1988 STS-30: Magellan, May 8, 1989 STS-61: 1st Hubble servicing, Dec. 2, 1993 STS-63: 1st approach to Mir, Feb. 3, 1995 RIGHT Elbow-deep into the job of removing the old Pad B elevators are Richard Rasor (left) and Bob Bebout. Below, Duke Webb wields a blow torch to extricate the old system while Dary Boltz (right) cleans up the debris. All four are with Mid-American Elevator, Chicago. Honeycutt bids KSC a fond farewell John F. Kennedy Space CenterSpaceport News The Spaceport News is an official publication of the Kennedy Space Center and is published on alternate Fridays by the Public Affairs Office in the interest of KSC civil service and contractor employees. Contributions are welcome and should be submitted two weeks before publication to the Media Services Branch, PA-MSB or sent via email to the following SMTP: Paula.Shawa-1@kmail.ksc.nasa.gov Managing editor. . . . . . . . . . . . . . . . . . Lisa Malone Editor. . . . . . . . . . . . . . . . . . . . . Paula Shawa Editorial support provided by Sherikon Space Systems Inc. writers group.USGPO: 532-112/20042SPACEPORT NEWS March 14, 1997 Page 8Bridges said he sees himself as a manager who tries to balance between delegation of authority and responsibility with being the kind of boss who likes a lot of face-to-face time with the folks who are in the trenches. When asked to define his management style, Bridges was firm: To be a leader, he stated. I intend to take on the big issues, to press forward. The designation of Johnson Space Center as the lead Shuttle center does not represent a significant shift in KSC's role, although he expects to be traveling to Houston quite a bit. My view is, this is where the hardware is, Bridges said. We touch it every day. Additional excerpts from Bridges' first press briefing as KSC director: The top priority has been and will be safety, he stated unequivocally. The pace we're going at today is a determined, predictable pace, like a marathon runner, he observed when asked about the legacy of Challenger, noting that back then schedule was perhaps too much of a driver. In response to a question about worker morale, Bridges said he sees KSC undergoing a period of transition, not crisis. I see a period of change, and when change is well-managed it Calling it the coolest job on the face of the Earth, Jay Honeycutt departed KSC March 3 after a two-year term as center director. I've enjoyed my watch immensely, he said at a final news briefing Feb. 28. After a 37-year career in government service, the highlight without question was being center director he told a small gathering of reporters. When the crew can come back from a flight and say they never had to pull out the malfunction list (as happened with Mission STS-82), that's about as good as it gets, he said. The toughest moments for the KSC director are just before liftoff through ascent to orbit, Honeycutt said, adding that he has always been in the firing room for launch, and looks forward to seeing his first one from outside.Bridges. .(Continued from Page 1)can be good, he observed. Any time you do something different, you have to be very careful about it. On downsizing work forces and tightening budgets, Bridges noted that his final years in the Air Force covered a time of radical downsizing, so he is familiar with the challenges this presents to a senior manager. With launch of the International Space Station not that far away, Bridges placed strong emphasis on KSC's role in future spaceflight endeavors, noting that he looked forward to playing a role in bringing those projects into focus. He talked about KSC becoming a worldclass place for launching payloads on any vehicle. He hopes to bring one more senior staffer to the fourth floor of Headquarters to work with him, but beyond that sees no wholesale changes in management. When asked how long he expects to be here, Bridges said he didn't know, but expressed his belief that top leadership positions should shift every three to five years to bring in a fresh perspective at the top. To explain his belief that there will be no dramatic changes at KSC under its new director, Bridges related his experience here in February for the STS-82 launch. It was flawless, he observed. How do you improve on flawless? 51-F ON-ORBIT, 1985 Bridges (center) served as pilot during the only abort-to-orbit in Shuttle history. He said that he hopes he always retains the memory of what it was like to be a payload during such a precipitous moment, but also noted that the incident showed the NASA can-do spirit at its best, as the mission was completed successfully and even allowed time for lighter moments, such as here with Mission Specialist Tony England (left). ONE of Center Director Jay Honeycutt's final official duties was to present a KSCbuilt Shuttle model for display at the Space Coast Stadium in Viera on March 1. From left are Duane Dickey, Phil Stroda, and John Poppert, all DM-DTL; Ken Lehner, director of Brevard Operations for the Marlins; Honeycutt; Hugh Manatee the mascot; Wade Ivey, Ivey Construction; and Jim Niehoff, Mike and Suzanne Dininny, also DM-DTL. The model was designed and fabricated by Mechanical Engineering (DM) employees in the Engineering Development (DE) directorate.